During the sweltering summer heat, families in the Portland, Oregon area often head for the coast to cool off, but clearly this is only a temporary solution. After heading back home, there is still the prospect of trying to get a good night’s rest on a hot, uncomfortable mattress. But with the great https://www.mattressworldnorthwest.com/mattress-deals/ available at Mattress World Northwest, there is no need to sweat through the night. Our Sleep Specialists will walk you through our showroom and explain the latest sleep technology innovations that can help you stay cool all night long. No one mattress is perfect for everyone, but chances are pretty good that you’ll feel right at home on a latex, gel-infused memory foam, environmentally friendly organic option, or other cooling mattress choice. Sleepers often give rave reviews to latex mattresses for their ability to keep cool throughout the night. However, not all latex mattresses are created equally. For better breathability, you might want to look for a bed made from natural latex, rather than synthetic. 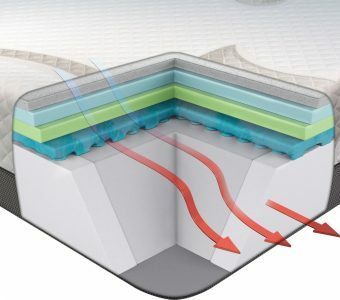 Mattresses with thick layers of cushioning on top tend to hold in the heat, while those with purposely created pinholes tend to circulate air better. For even better breathability, select a mattress cover made from wool or cotton. As a general rule of thumb, memory foam mattresses do tend to hold in the heat. However, gel-infused memory foam beds are a different story. One premier example is the Easy Rest Gel Lux, which is made with superior 5.3 pound open-celled gel memory foam that is specially designed to release heat. As an added bonus, this choice also relieves joint pain, muscle tension, and numb limbs. Natural material usually beats synthetics when it comes to dispersing heat and keeping sleepers cool. For incredible comfort, try out the OMI Models series. The organic wool quilting is well designed to regulate body temperatures to help you sleep through the night. Innerspring sleep technology has come a long way over the years. Now, innerspring designs can be flawlessly merged with gel-infused memory foam, which helps disperse the heat to keep you cool all night long. When you stop by the showroom, consider test driving some of the models in the Innerspring Series by Sealy. Since everyone has unique preferences and sleep needs, the best way to choose the right mattress for you is to visit Mattress World Northwest. Our Sleep Specialists will perform a custom sleep analysis to develop recommendations specifically for you. And because we are a locally owned and operated company, you can trust that you’ll save more money with us than anywhere else. We even offer a 90-day exchange policy to ensure your complete satisfaction! Before you stop by one of our showrooms in the Portland area, be sure to print out our current coupon offers. Got questions? Call us at (503) 713-6572.